focus on their primary goal of operating a correctional facility. Through Praeses’ subject matter expertise, oversight, and unique technologies, clients maximize financial and administrative resources. The RFP and contract negotiation processes can be challenging and extremely time-consuming. We work with you and your team to understand your unique needs. Our experience speaks for itself. Whereas most correctional agencies only write an RFP or a contract every 3-5 years, we assist our clients with numerous RFPs or contracts every month! We offer a range of professional services. 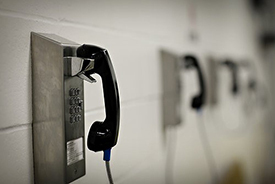 The management of the various inmate communications methods can be very burdensome for facility staff. We act as an extension of your organization; by being independent and without any allegiance to any service provider, we work alongside your staff and help save you time. Reconciling and validating accuracy of calling rates, fees and generated revenue takes expertise and time. We validate revenues reported by your vendor for the life of your current contract.